I have never forgotten the date of my Wedding Anniversary. Been 34 years now. – my mother-in-law took me literally when I answered her question of WHEN? I think I got the better deal. My poor wife ended up with a screwball. A recent visit to Marguerite’s blog at Canoe Corner turned out to be more than a pleasant visit. I ended up ‘walking away’ with a $50 gift certificate for commenting on her post about Novica, a web site featuring artists and crafts people and their creations from third world countries. The site is associated with National Geographic so that should give you an idea of the quality you’ll find there. When I first arrived on Marguerite’s Novica post I almost bailed out. Not another blogger pushing some affiliate marketing pitch I thought at first. But no, it wasn’t a affiliate ad link disguised as a text link. I’m happy I didn’t give in to my cynical first impression. It’s not the ‘prize’ I won but the discovery of a wonderful resource for both those looking for gift ideas and those that create them. I am a bit sad about my name being pulled out of the hat. Maybe others had the same first impression and didn’t follow the link. Whatever the reason it’s a shame the odds were staked in favor of the few who did check out the site and left a comment. Good for me, not so good for a worthy cause. Excerpt: By recognizing the value of artistic goods in the third world we can help artists there to live a better life and contribute to the betterment of their communities. There’s a lot more going on at Novica. That’s globalization I can support. I’ll leave it to you to check out the programs they offer. They have an affiliate program that’s rewarding to both ‘Affiliates’ (sometimes it’s not a four letter word) and Artists. After posting this I’m going to check it out. Want to follow me there? Here’s the link to become an affiliate. Sorry Google but your ads are looking like history on my blog. Not interested in being an Affiliate, then maybe you’d be interested in hosting a Home Party featuring some select Novica items. Interested? Here’s a link. Novica Home Parties. I’m not that sort of party person. Guess it’s a male thing on my part but I’d like to see one of my daughters give one of these. I won’t go on about the loans but will say I made one before setting up the link ..and before you possibly gush over a perceived generosity on my part let me say it definitely was a micro-loan. I hope you will consider one too. It all looks too good to be true. Everyone comes out ahead as far as I can see. This is how globalization should work. By helping to raise the living standards of those in the 3rd world I also indirectly help to float my own boat. …and did I mention the Novica products make gifts that will drop the jaw of even an old cynical curmudgeon like myself. The Tea Set by Tat Yan Soo. His style is very pleasing to my tastes. I liked the Peaceful Lily set but grand daughter likes frogs. Ah, I can’t NOT post an image. 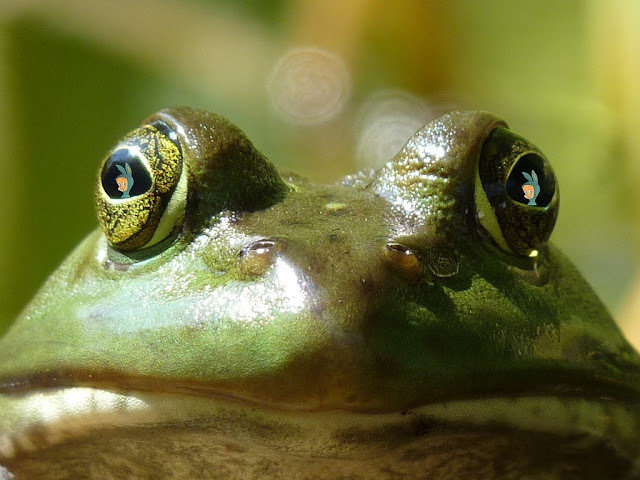 Please stare into the Hypno-Frog’s eyes until ready to buy. Frog themes are acceptable.